These last few weeks of October have brought out the colors of the season; and for Kathy and me, this has been a time for focusing on growing Lionism at the grassroots level. To that end, a group of Lions leaders have joined with me to organize a new club in the Fargo community. It’s going to be a Saturday morning, family-friendly club focused more on performing service and less on attending meetings. It’s exciting to think that we can add a new club to the Fargo community. We’ll keep spreading the word and hope to have good news to report in the near future. 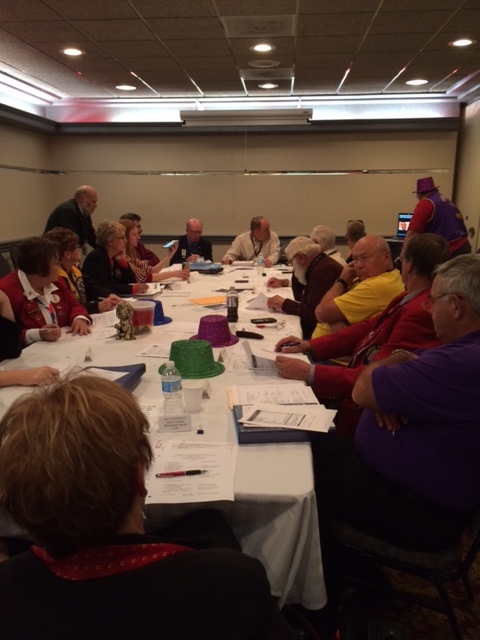 October is also the time for the two ND districts to come together for their annual convention. Kathy and I were happy to be in Minot where we welcomed first year International Director Roderick Wright as our official guest. 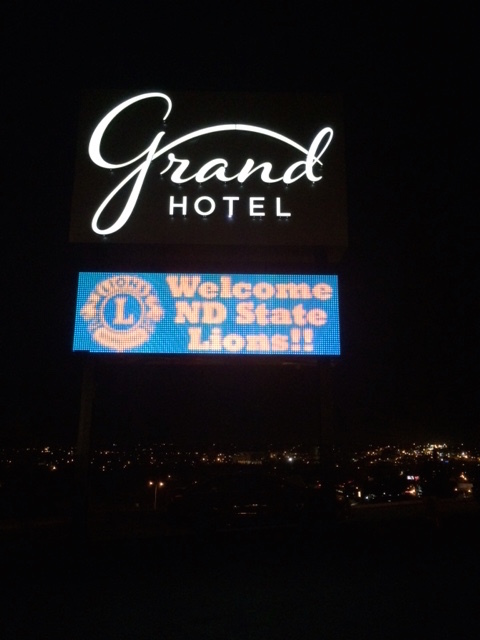 Lions were welcomed to the Grand Hotel! ID Rod did a fine job when he met with the cabinets of District 5NE and 5NW. He provided a briefing of what was accomplished at the LCI International Board meeting earlier in the month. Throughout the convention, his engaging style and approachability were well-received as he interacted with the Lions. While we spent most of Friday in meetings . . . The Lions Foundation of ND met with some members joining by Adobe Connect. we knew that fun was awaiting us at the Halloween Party! The Minot Magic City Lions did a fabulous job of mixing things up so that everyone was involved. The Fargo Lions decided to dress as a team . 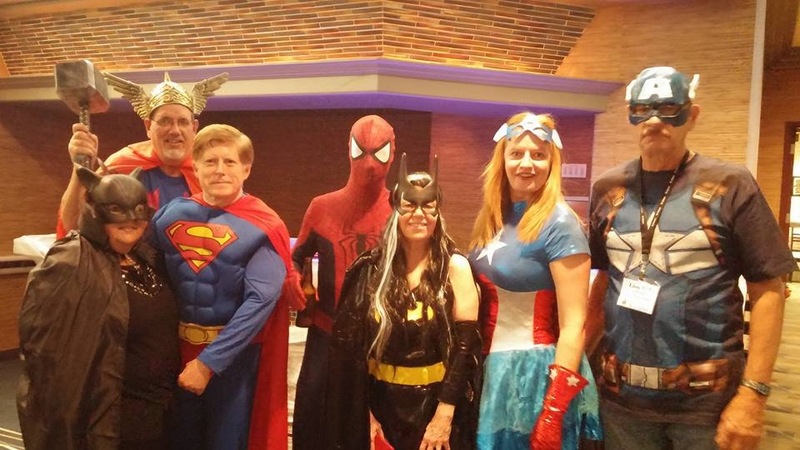 . . and we can assure you that we had a “super” time! 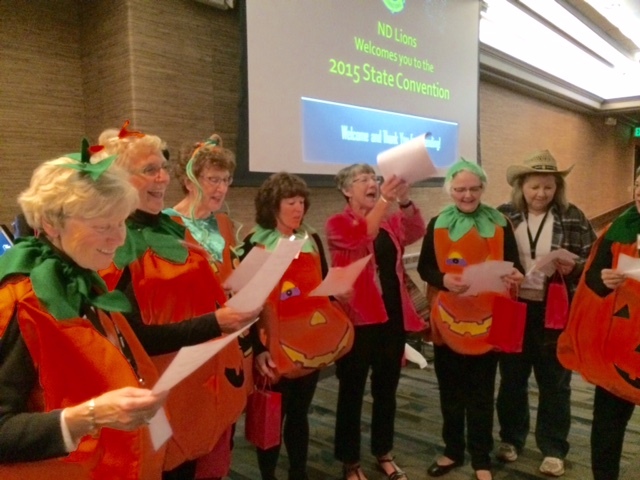 The Prairie Rose Lions from Bismarck also dressed as pretty as pumpkins and they even performed a song! We all had lots of fun. 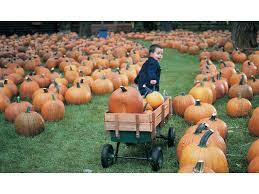 The Lions of Prairie Rose pull no pumpkins–I mean punches–as they perform at the party. On Saturday, the program included district meetings, a range of informational sessions, the Hall of Fame induction, state meetings, a memorial service and the banquet. 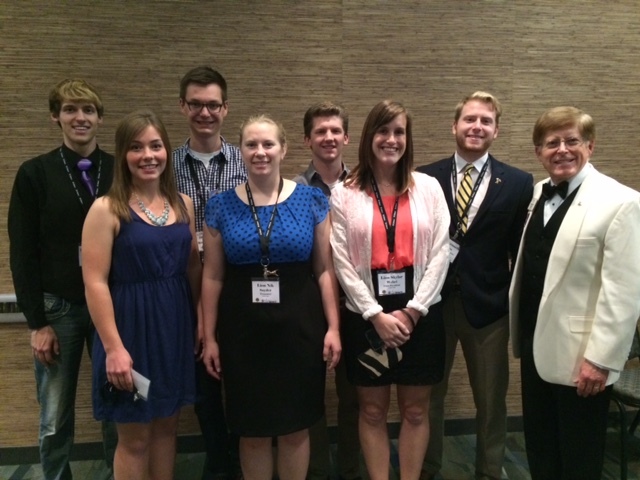 The NDSU Campus Lions Club was named 2014-15 District Club of the Year. The club also received its Diamond Patch for the Centennial Challenge. 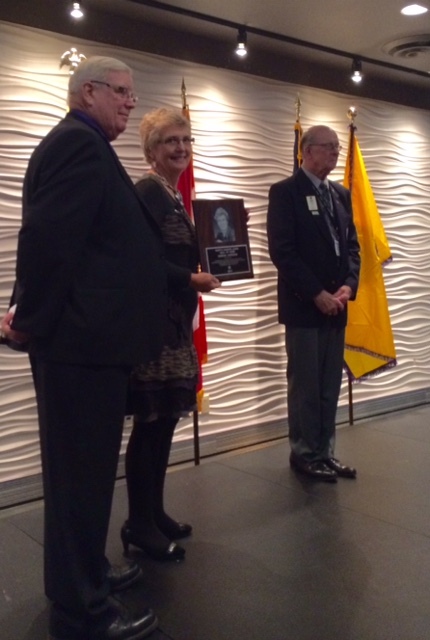 Past District Governor Marian Johnson from the Bismarck Prairie Rose Lions was the 2015 inductee. Her dedicated service at the club, district, and multiple district levels has been outstanding. In addition, she was a highly-rated instructor at the Great Plains Lions Leadership Institute. 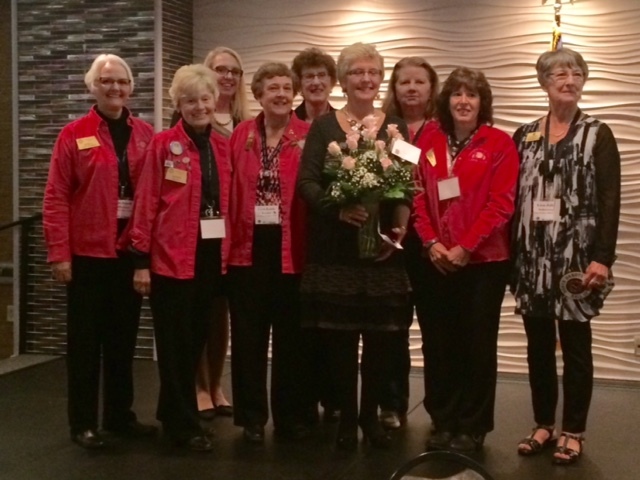 PDG Marian Johnson received her HOF plaque and ring at the luncheon. 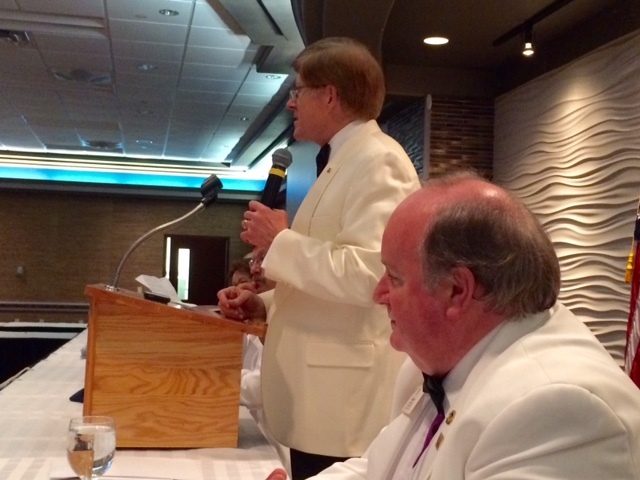 Pictured here with her husband, PCC Brach Johnson (L) and ND PDG Association President Lewellyn Rustan (R). Prairie Rose Lions present their first HOF inductee with a bouquet of roses following the ceremony. 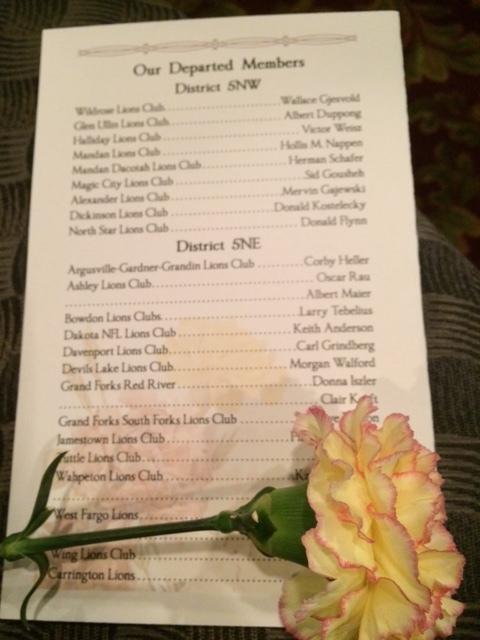 The Lions from both districts who died over the past year were remembered in a beautiful service. In the evening, the focus was on ID Rod Wright and his presentation. However, we did take the time to honor PDG David Blackstead from the Bismarck Capital City Lions Club with a Progressive Melvin Jones Fellowship for his 62 years of service. 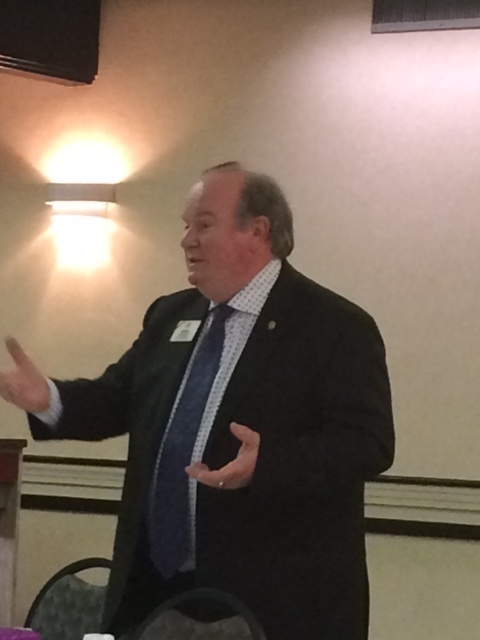 Past International Director Bruce Schwartz provided a review of PDG David’s important role in his club and in the state. ID Robert introduced ID Rod at the banquet. ID Rod spoke about passion and service. He was presented with a MJF from the two districts in recognition for his service on the board and his participation at the ND convention. 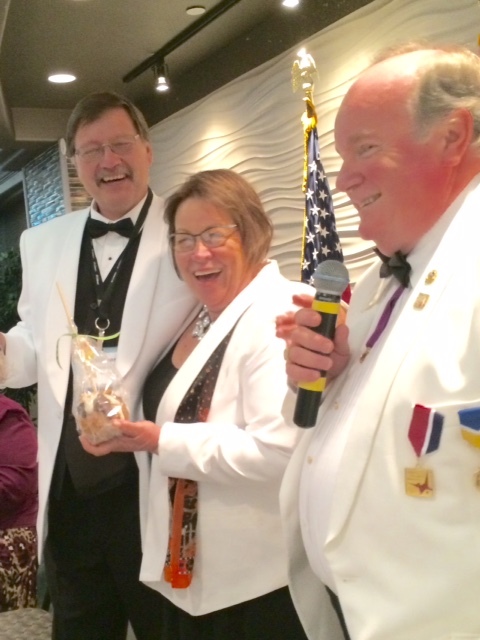 ID Rod presents caramel apples to DG Rick Swenson and DG Judy Beaudry as the banquet concluded. 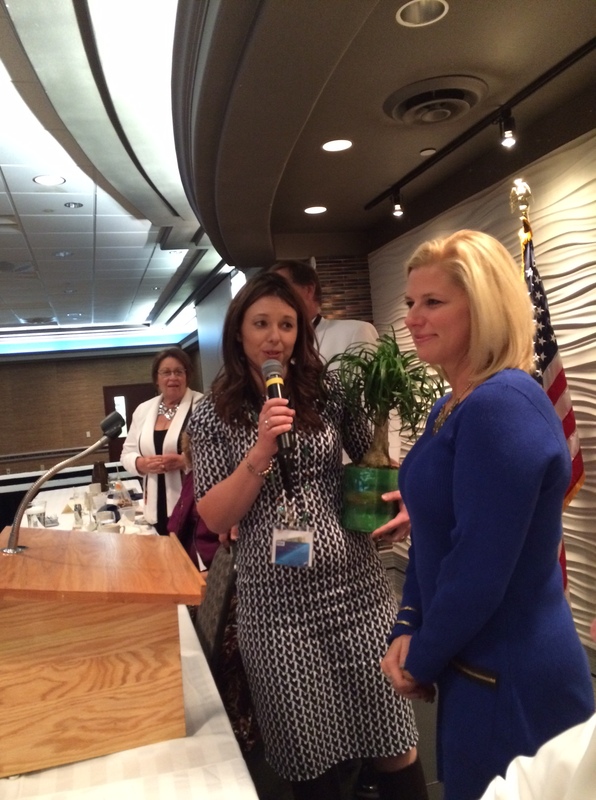 The co-chairs of the local host committee received our praise for the great job they did. These young Lions took on the task of organizing a convention and exceeded all expectations! Thank you Lion Anna (L) and Lion Nicole (R). On our way back to Fargo-Moorhead, Kathy and I turned our attention to the month ahead. Our next visit is to Williamsburg, Virginia and the District 24B convention. In addition, our annual “Speak Up for Service Day!” is around the corner, reminding Lions everywhere that we need to let people know about what we are doing and the impact our service provides to those in need. Speaking up is the best way to spread the word about Lionism. 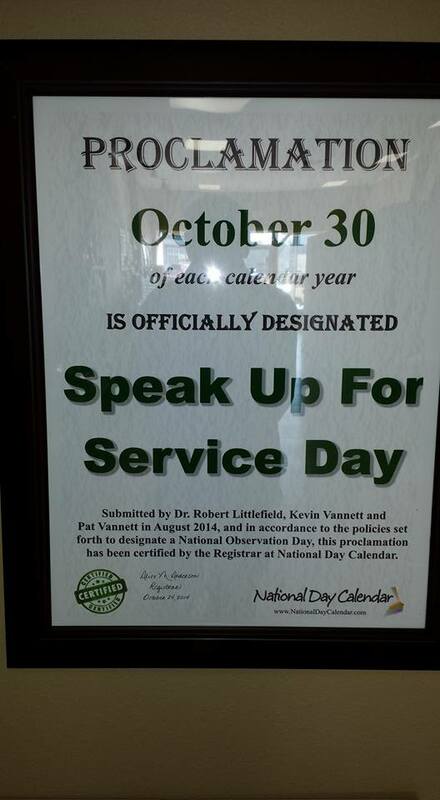 The Annual “Speak Up for Service Day” is October 30th. Thanks to PDG Kevin and PDG Pat Vannett for their sponsorship of this important day; and best wishes to all who serve and help to make the future a little brighter for those in need.